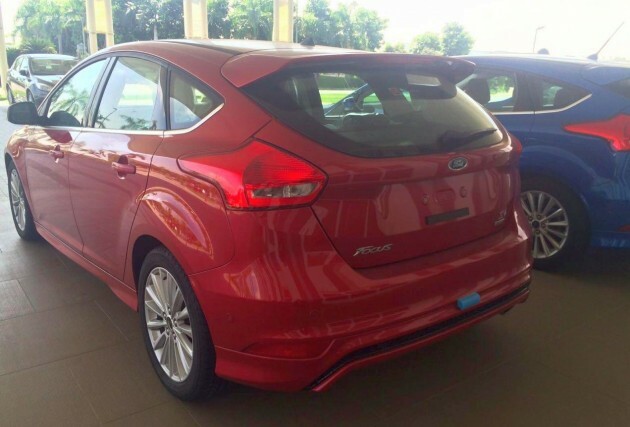 C346 Ford Focus facelift - 1.5L EcoBoost hatch and sedan variants sighted in Malaysia, launching soon? 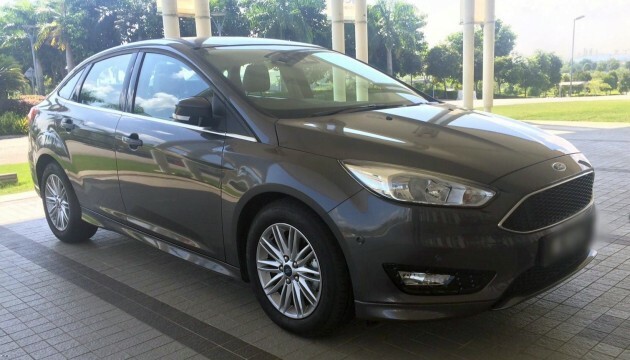 Home » Cars » Ford » C346 Ford Focus facelift – 1.5L EcoBoost hatch and sedan variants sighted in Malaysia, launching soon? 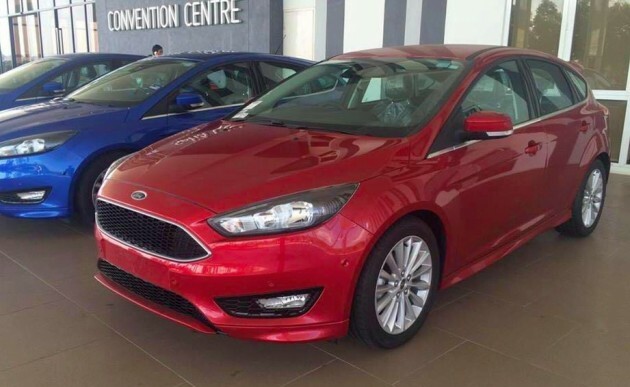 C346 Ford Focus facelift – 1.5L EcoBoost hatch and sedan variants sighted in Malaysia, launching soon? Not long to go before the third-generation Ford Focus facelift premieres locally, by the looks of it – hatchback and sedan examples have been sighted in the country. Seen parked at Setia City Convention Centre, photos of these cars emerged on a local forum earlier today. These are undoubtedly lead examples sent in for SDAC to conduct product familiarisation and sales-related training work. Back in August, we reported that the refreshed C346 – which had its ASEAN premiere at the IIMS and GIIAS shows in Jakarta last August – was due to make its debut here in January this year. Word from the grapevine has it that the launch will only happen after Chinese New Year, though no indication as to exactly when yet. The photos do give us more than a few clues as to what to expect when the time comes. The hatchbacks seen in the photos (dressed in Candy Red and Winning Blue) denote that what will be selling here is a Sport+ model – exterior-wise, the vehicle mirrors the Australian-spec mid-line Sport variant, with the same body styling kit (side skirts, front and rear diffuser extensions, rear sports spoiler) to be seen. It also features the same 17-inch multi-spoke alloy wheel design, which are shod with 215/50 profile tyres. The photos also reveal what we’ve expected for some time now, that the facelifted Focus range for the ASEAN and Oceania markets has dropped bi-xenon headlamps from the specification. The current pre-facelift Sport+ hatch and Titanium sedan have bi-xenons, but the new cars make do with complex surface reflector halogen units, as also seen on the Australian-spec and Indonesian market offerings. The CSR units feature LED daytime running lights, sitting on the upper part of the headlamp assembly. No photos of the interior, so there’s no way to ascertain yet if the local cars will come equipped with a SYNC 2 infotainment system and corresponding eight-inch central screen as seen on Australian cars or be kitted as that found on Indonesian variants, which only get a 4.2-inch screen and original SYNC. Likewise, safety kit – there should be six airbags (Indonesian cars only have two) in there, because any less would be unthinkable. We’ll try to find out more about the equipment levels on Malaysian cars, but if the levels follow Oz-spec trim the Sport+, and these include a nine-speaker Sony sound system, keyless entry with push-button start, leather-wrapped steering wheel and gear shifter. Also on, auto headlights and wipers and dual-zone auto air-conditioning. As for seat trim, the Sport features fabric seats, though we might get leather if we follow Indonesia’s example of up-speccing things. The Titanium sedan wasn’t seen during the Asia-Pac regional drive for the car last September, but the general specification and trim shouldn’t veer too much from the Titanium hatch, which is not going to be sold here. As such, equipment should include a six-way power-adjustable driver’s seat, leather inserts and bolsters for the seating and a sports suspension. A change to the wheel on this one though. In Australia, the Titanium sedan wears 18-inch five-spoke alloys and 235/40 rubbers, like the hatch, but the local car seen in the photos (finished in what looks to be the shade called Magnetic) is equipped with a previously unseen 10 double-spoke alloy, likely to be a 17-incher. Whichever the body type, the facelifted Focus will be available here – as it is in other markets across the region – with a 1.5 litre EcoBoost engine. The Sigma-derived GTDI four-pot, which has 180 PS at 6,000 rpm and 240 Nm at 1,600 to 5,000 rpm for output numbers, replaces the 2.0 litre Duratec 20 normally-aspirated Ti-VCT GDI engine as powertrain choice. The mill is paired with a SelectShift 6F35 six-speed torque converter automatic gearbox, which takes over from the Getrag 6DCT250 six-speed dry-type double clutch transmission seen currently. The unit, co-developed with GM, is also seen on the C520 Kuga and the facelifted CD391 Mondeo. We’ve driven the facelifted Ford Focus 1.5L EcoBoost – read our Australian drive review of the hatch, which also comprehensively details the changes from the pre-facelift Focus. Never ever buy Ford la. They got the worst after sales service ever. Be warned. Ford autoKONEKsion holds your car for 3 months just to replace any small part. My car, bumper kena bang, Ford AutoKONEKsion took 3 months to order the part. They held my car for 3 months. For 3 months I had to take bus everywhere. That is their policy, they must hold your car for however small the damage is. I asked them where the part comes from, they said Singapore. What? Singapore? I thought 3 months, it was coming from EU or Africa. But instead, 3 months, it comes from Singapore! What a shocker! Don’t know why the bodohs in Ford and Sime Motors cannot stock up parts in a warehouse beside the service centre (Ford PJ). So many empty warehouse there for rent and sale, can easily stock up parts there. With this toilet jamban service, do you dare to buy a this car? In contrast, my Honda Accord bumper got bang, Tenaga Setia in Jalan 222, took 3 hours to replace the bumper, with the same paint colour. 3 hours VS 3 months. You decide! Yea my ford kuga engine recently overheated. Smoke coming out of the engine. Same goes to my friends ford kuga. I guess these things are fragile. But they replace the parts in 1 day for my car so I guess I’m lucky. Getrag 6DCT250 so good so advanced also dropped…why? Bcos not many ppl know how to drive a dual clutch. They all thought is a normal torque converter and drive it like one, riding the clutch all the time diring traffic jam, don’t use handbrake during hill start, clutch sure fast fast kaput lor… Later service center stockpilied with clutch warranty replacement, so Ford decided to ditch it. Actually, can’t blame the consumer also. Majority of car users buy a car to drive from A to B and not many people are willing to go down to technical details to have a better understanding of their car’s characteristic. Simply put, dual clutch techonology is not there yet to fully replicate a completely idiot proof execution where every novice driver can just sit behind the steering wheel and drive it as smooth as the torque converter without any jerkiness or shuddering, especially in slow traffic condition. The biggest problem with dual clutch transmission is it doesn’t have a pair of eyes that can judge the real time traffic condition as good as a pair of human eyes. It could only “guess” the driver’s intention by sensing your throttle input and regulate the clutch based on that. Hence, in most traffic jam or slow crawling traffic, dual clutch transmission tend to jerk and shudder, just like how a novice manual driver who just got his license tend to struggle with the clutch. This is what happen when you delegate the work originally done by a human left foot to some computerised solenoid or electric motors, it just don’t work as seamlessly like a torque converter, all in the name of convenient and some drivers reluctant to work his/her left foot. The other problem with dual clutch transmission is about its mythical “lighting speed shifting”. Actually, dual clutch doesn’t necessarily shift faster than a normal slushbox, sometimes even slower. You see, dual clutch lighting fast, milliseconds shifting speed is only applicable when you line it up in a drag race, floor the throttle and watching the gear up shift one by one. In a real world driving condition, we are faced with different bends, speedbumps, emergency braking, slow traffic and etc… When that happens, how would the dual clutch box anticipate what is coming next? Upshift or Downshift? It could only make a wild guess on your intention by sensing your throttle input. What happen if it guess wrongly? When that happens, it’s kinda embarrassing because it will forcefully disengaged the synchro mesh from the gear it originally anticipated and forcefully insert the mesh into the gear that you really wants. Anyone who drive a outgoing DCT Focus will know what I mean, that nasty grinding sound when you abruptly brake the car during acceleration. The next myth about DCT is all about its seamingly “high tech” aura that many people tend to belief. Actually, DCT are just merely two sets of manual transmission with a computer controled clutch pad, that’s all. In terms of cost, it’s even cheaper to build compare to a good old slush box because of its simplicity. It doesn’t has a torque converter, no ATF oil and certainly no multiple clutch plates and lock-up mechanism required, less money and effort to produce. In the end of the day, I’ll gladly trade any DCT for three pedals. And with the incresingly demise of manual transmission knowledge and manual driving experience among new generation of drivers, more and more DCT problems will emerge because our tehnology is not there yet to build a DCT that is completely idiot proof to anyone who thinks “driving is all about putting it to” D”, follow by pressing the throttle and brake until you reach your destination”. It just doesn’t work that way, although all DCT manufacturer, be it DSG or Powershift wants you to believe so. For all DCT owners, drive your dual-clutch just like driving a manual, ie, do all the shiftings by yourself using manual mode (you are the driver who has the situation awareness, don’t let some half bake computer decide fo you), don’t ride the clutch during traffic jams, use the handbrake during hill starts and so on… A DCT is actually a manual in diguise, drive it like one and you can iron out many issues associated with it, at least no more shudder and longer clutch life span. And you won’t be rushing to the service center every 20,000km complaining about the jerkiness and transmission overheat problem. Long Live The Manual. Well said. All my cars on manual. True on your comment, IF BN Government play fair car price in Malaysia all Rakyat Malaysian will be like you idea BUT infact we been giving UNFAIR treatments by MAI / MITI and BN cronies ! Dude i supposed to drive the car, not to let the car drive me crazy! 6DCT 250 only can support Max torque up to 280nm. Ford wouldn’t take the 20% buffer as hassle risk for sure. 6F35 easily can last for 350nm, why not dude? Have Ford Solve the gearbox jerking problem? Before you ask that question, you must understand how a Dual Clutch Transmission works. Pls refer to the above (though lenghtly) comment, and you’ll understand why it jerks and how to prevent it. Simply put, current technology can’t make a DCT that doesn’t jerk, even in an Audi, Mitsu Evo X or Nissan GTR. the jerkiness is not 100% solely problem..more to dct behavior. reviewed and agreed by various of users and journalist. but of course my friend fiesta got this kind of problem..end up found out gearbox leaking problem. I don’t think so. Perhaps that is why they ditch the DSG for a conventional torque converter auto. Somehow it feels like spec levels have dropped compared to the previous model. Only saving grace would be the 1.5T and it’s torque converter gearbox. Hope I’m wrong. Nope, this face-lifted is much much more refined than the previous one. Drive it and you almost feel like its an entirely new car. To me, the catastrophic human-interface of the previous version had largely been mitigated in this current form, at least no more blackberry style, many buttons centre dashboard command. Most important, it doesn’t comes with that jerky, all logically messed-up dual clutch transmission. This one runs on a good old slush box. So Honda, what is your reason for not bringing in 1.5 turbocharged Civic in the future? Could you please make it possible for me to view the desktop view on my iPad? The mobile view is not suited to a large screen such as an iPad has. Can you please make it possible to view the Desktop view of this site from an iPad? The Mobile view is not suited to an iPad. simple. reliability. but of course sooner or later people will embrace the technology..
Bcos all DCT are not as smooth as VW DSG but DSG reliability is crap..
Would be a little surprise if ford to 100% replace NA to ecoboost. Why no more TDCi engine? MK2.5 is the last. Halogen lights? Why the reversal from bi-xenons? can anyone share with me if the ford dry clutch gearbox is also as problematic as the DSG? Would love the estate body style. Very underrated car, IMHO. I’m sure there will be takers if made available. This is what Honda should do; introduce turbo engines. Even Ford knows this is the way forward. Ford Focus 1.5 ecoboost vs Mazda 3 SkyActive. Which will you choose? Does the car comes with turbo timer inbuilt? Turbo without timer for engine to cool down = suicide. Although some people still practice idling the engine after a hard drive before shutting it off, but it’s really more of a psychological thing…like how some people like to turn the car to ACC and let the lights go out before cranking the engine. in the case of Ford’s turbocharged engine systems (and probably some other makes as well), there is an auxiliary coolant pump which works if things are still a bit too hot after you shut off the engine. it’s capable of cooling a full loop which includes block radiator and heater core, a ‘short loop’ which goes through the engine head block and heater core. As much as I like to believe what manufacturers have said about cooling, in real life these new small cc Turbo engines do overheat and create problems for owners. Just read the above, the Kuga is suppose to have one of the new Engines but owner have reported overheating. The new Peugeots suffer from the same overheating as well. All in all, turbo cars are not as reliable as a bigger cc NA in Malaysian weather. Its not just hot but you get sudden cold when there is thunderstorm. Image your burning red hot turbo suddenly get splashed with cold water as you drive into the rain & pool of flood waters. how the heck will adding turbo timer solve the issue of turbo suddenly hitting flood water ? the weather in the land down under is far more erratic than here in M’sia, peaking at 40deg and dropping to 18deg in the same day. don’t hear of many issues with small turbos there…face it, m’sia isn’t the only country with hot climate. Summer in the states gets pretty bad too. why you want to take out the bi-xenon lights ??? It makes the car look more upmarket especially this is a continental C segment which is not cheap. I am a Fiesta 1.0L Ecoboost fans. Thinking of getting the new focus as my second ride. Honda will launch the 1.5 turbo soon but new Ford focus is launched today. I can’t really decide which car to choose only untill the new Civic is launched. The 6F35 gearbox seems can last more than 400nm of torque, this is very interesting for after market remapped purpose. Thanks God, my little ecoboost fiesta didn’t give me any problems but only 1 time disc rotor (front left) skimmed. That’s all. Sent the car to Ford Kencana, complaint solved and now so far so good. Clocked 30,000 km after 13 mths, gearbox seems performing well. Maybe due to I drive mid to long distance to work. No jerking at all.